Two people have been killed and three injured in an attack in a park in the Democratic Republic of Congo, a United Nations-backed radio station says. Radio Okapi says a vehicle belonging to the environment group WWF, which was carrying 11 people, was ambushed by gunmen in Virunga National Park. The wife and daughter of a park warden were shot dead in the attack. 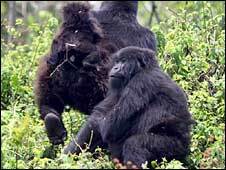 Armed groups frequently carry out attacks in the park, home to at least 380 endangered mountain gorillas. 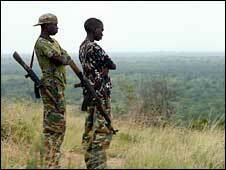 The park is in a volatile region in eastern DR Congo where rebels have set up a base. Since September, rebel forces have controlled the area, threatening to kill any conservationists or gorilla rangers who attempt to enter the region which is home to more than half of the world's mountain gorillas. Radio Okapi quoted local officials who blamed the attack on Mai Mai rebels, and reported that the attackers stole GPS devices and personal belongings. Members of the local Congolese Institute for the Conservation of Nature (ICCN) were also travelling in the vehicle at the time of the attack. In July 2007, armed men entered the park and shot five gorillas at point-blank range.